Feeling determined: Adel Al Hendi. The buzz is reverberating all the way from Sri Lanka as the UAE sevens squad stands on the brink of something very special. More than 3,000 kilometres away in Colombo, Roelof Kotze’s men are hunting a top-eight finish in the third and final leg of the Asia Rugby Sevens Series this weekend. With that they would cement their place among the best eight teams in Asian sevens rugby and secure automatic qualification for the 2016 competition. There is an increasing wave of optimism coursing through a squad whose confidence has been boosted by ninth and sixth-placed finishes in legs one and two, respectively. “It’s a huge weekend for UAE rugby, it really feels like we’re on the verge of doing something special,” said UAE captain Niall Statham. “We’re not a surprise package now so other teams are ready for us but I have real belief in the boys, we have the potential to better our finish in Bangkok. The UAE play Japan and Chinese Taipei in Pool A today, knowing that one win should be enough to put them into the Cup quarter-finals tomorrow, which will guarantee them a place in the core eight of countries for next year’s series. Victory against the number one ranked Japan might well be a big ask – the UAE lost 39-0 to the men from the land of the Rising Sun in the last eight in Thailand two weeks ago – so beating Chinese Taipei is a necessity. 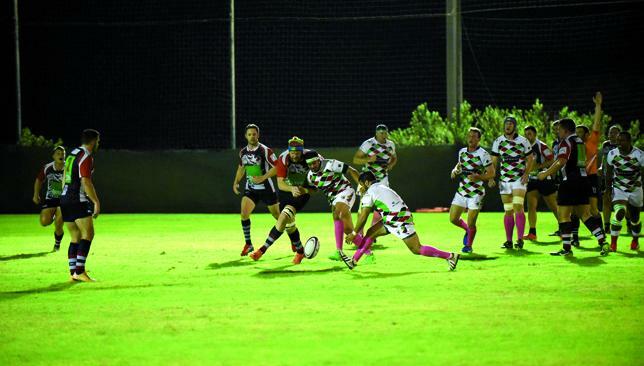 Abu Dhabi Harlequins host Al Ain on the back of an impressive victory at Jebel Ali. Al Ain Amblers head coach Andrew Rouvi has described their encounter with Abu Dhabi Harlequins as a “David versus Goliath” clash, but insists his team can shock the reigning UAE Premiership champions on Friday night. To compound the fact that Amblers have shipped 63 points in their first two games back in the UAE top flight, they will also be without several key players as they head into the lion’s den at Zayed Sport City. Their Kiwi coach is also away in the UK, watching the All Blacks at the Rugby World Cup, but he feels Amblers are capable of a shock. “We have a few players unavailable, a total of five who are all key members of this squad,” said Rouvi. Absentees include Esekaia Dranibota, Tito Asafo (injured), Devante Steele (in Sri Lanka with the UAE), Khalid Aljunaibi (Shaheen duty) and Sakiusa Naisau (suspended). focusing on developing our players so any opportunity to blood new players will always be important to our cause,” he added. Andrew McKinney and Semi Asafo, both players from last season’s UAE Conference-winning squad, come in, while fresh faces Mahmoud Sharkawi and Robert Dorward – both fairly new to the game but have shown a lot of promise – could feature. More of a concern to Rouvi, however is discipline after a host of cards in their opening games. “The challenge for us will be to keep our discipline, especially around the breakdown,” he said. Quins will be without several players who shone in last week’s 35-7 thumping of Jebel Ali Dragons, so head coach Mike McFarlane is looking for his second string players to steal the limelight. Centre Brian Geraghty and full-back Alastair Johnson are out, while winger Chris Marshall is on UAE duty in Sri Lanka. “Big games keep coming with a physical and attacking side in Al Ain,” said McFarlane. “Both teams are certainly preparing for a battle. We are missing multiple players to injury and absence, with several injuries coming from the last game against Dragons. Iziq Foa’i, who announced his return to Zayed Sports City last week, remains sidelined, while prop Chris Jones-Griffiths and James Macauley are also out. Exiles coach Jacques Benade has thrown his weight behind the UAE national teams – even though it means he will be without several of his stars for Friday’s trip to Abu Dhabi Saracens. Full-back Charlie Sargent is away with the UAE sevens team for the third leg of the Asia Rugby Sevens Series in Colombo at the weekend, while Justin Walsh is unavailable after sustaining an injury on international duty at the second leg in Bangkok last month. However, with the UAE on the cusp of capturing a top eight berth in the Asia rankings, Benade is not complaining. “Due to the UAE sevens we are without Charlie Sargent, who played really well last Friday, and Justin Walsh who got injured in the last tournament,” said the South African. “But for us as a club it is very important that we support the UAE and the players that play for their country even with a big game against Saracens this weekend. After beginning the season with two home wins, Exiles now face five straight away games, starting with a trip to fortress Al Ghazal, where Sarries have an impressive record. “It is a very competitive league and I’m sure this will be very physical as Saracens will be very strong up front and very difficult to beat at home,” said Benade. Sarries’ joint head coach Stephen Hamilton is expecting a stern test from the new-look Exiles. “It’s a big week for the club, Exiles seem to have recruited well and have been showing good form in the first few games,” he said. Paul Hart believes Jebel Ali Dragons are close to a first win after opening up the new Premiership campaign with two straight defeats. 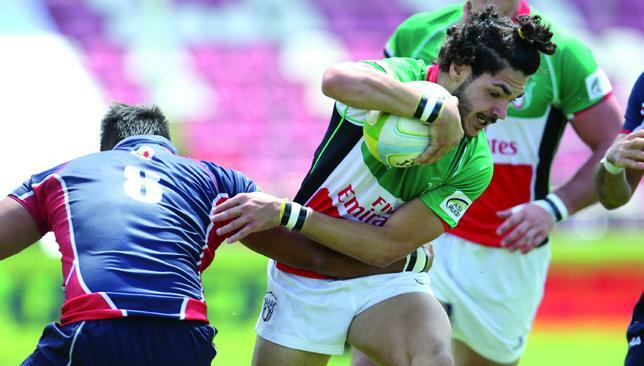 The fallen giants of UAE rugby will, however, again be without a host of players selected for the national team’s trip to the third and final leg of the Asia Rugby Sevens Series in Sri Lanka this weekend. Niall Statham, Ryno Fourie, Ian Overton and Mounier Kenny travel with the UAE to Colombo on Thursday, while Andrew Carphin and Imad Reyal have also been called into the squad. Canes will be looking to bounce back after an opening day defeat of Al Ain Amblers was followed by defeat in a Dubai derby against Exiles last week. Fly-half Andrew Powell will be out for at least a few weeks, but Andrew O’Driscoll should return for James Ham’s side. The immensely popular Mike Ballard (l) suffered a spinal injury last April. Mike Ballard has vowed to be as big a presence at Abu Dhabi Harlequins as he was as a player when he returns to the UAE, following his trip of a lifetime to the Rugby World Cup. Ballard remains in a wheelchair following the horrific spinal injury he suffered playing for Quins in the West Asia Champion Cup final on April 4, 2014. It is a day the 30-year-old will never forget, but having completed his rehabilitation at home in Michigan he is set to return to the capital at the end of the year. And his passion for rugby burns as brightly as ever. Indeed, it was on display last month as he and tour operator Ed Lewsey sped around the south west of England and Wales taking in World Cup games in Brighton, Cardiff and Twickenham. Ballard described the trip as “one last little hurrah before I go back into the working world” after Wales’ dramatic win over England. “A couple of the coaches out there have younger kids, and I’ve worked with the younger kids [so, I can help there],” he added of his potential return to Quins in a coaching capacity. Lewsey, a team-mate at Quins and co-founder of the Mike Ballard Foundation, kept the pair busy during their time in the UK. Ballard spent time with USA Rugby CEO Nigel Melville having watched the Eagles’ match with Samoa, while an altogether unplanned stop at Richmond en route to Twickenham resulted in a meeting with Wales legend Derek Quinnell. The breathless tour, meanwhile, also took in stops at Exeter’s Sandy Park, a Devon school, where the American gave a talk to pupils, the Royal Marines’ Commando training centre in Lympstone, where he trained, and Bisham Abbey, where he spoke with other people who have suffered similar injuries. As he pondered his whistle-stop week under Twickenham’s East Stand, the 30-year-old’s smile was infectious. The Quins hierarchy will be happy to hear Ballard has been keeping his hand in in Michigan, as assistant coach of his alma mater Gladwin High School’s American football team. And he has been passing on some tips from rugby too. 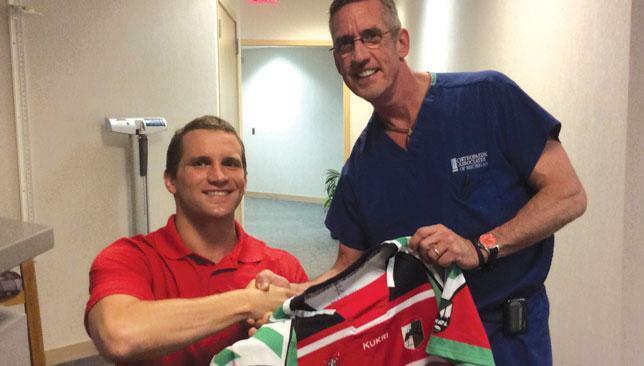 “They always ask me how much more aggressive rugby is and how much meaner,” he added.